Looking for a unique "get-away"? Then welcome to Wilson House B&B, Baltimore, MD. One of the finest and most historic Bed & Breakfasts in Maryland. It is the elegant home where William Jennings Bryant made the deals that gave Woodrow Wilson the Presidency in 1912. Wilson House has 40+ rooms, with twin parlors, eight fireplaces, 12 bedrooms, (10 with private baths, 2 share a private bath between them), numerous original chandeliers, a library, a den with sunroom, and 11+ baths. This includes the elegant attached apartment with two fireplaces and the best chandelier in the building. The current owners purchased Wilson House in 1999 and undertook a major restoration with many upgrades. 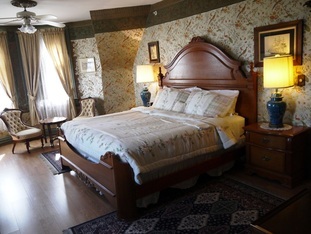 It opened asa B&B the Summer of 2004 but restoration and upgrades have continued since. Close to the Mt Vernon Cultural District, with easy access to opera, symphony, Johns Hopkins University, Maryland Institute College of Art, the University of Baltimore and many interesting restaurants, (running the gamut from neat little ethnic "holes in the wall" to four-star dining) theaters (film and live), museums, AMTRAK, MARC, Light Rail.